Metro Goldwyn Mayer Pictures (MGM) has partnered with Monkeypaw Productions' Jordan Peele & Win Rosenfeld to produce a re-imagining of Candyman, the 1992 horror classic adapted from Clive Barker's short story The Forbidden. The announcement was made today by Jonathan Glickman, MGM's President, Motion Picture Group. Rising filmmaker Nia DaCosta (Little Woods) will direct from a screenplay by Jordan Peele and Rosenfeld. The film, a "spiritual sequel" to the original, returns to the neighborhood where the legend began: the now-gentrified section of Chicago where the Cabrini-Green housing projects once stood. Production is expected to begin Spring 2019. Universal Pictures will release Candyman theatrically in the U.S. on June 12, 2020. DaCosta's feature film debut, Little Woods, starring Tessa Thompson and Lily James had its world premiere at the Tribeca Film Festival this year and earned her the coveted Nora Ephron Award. Peele wrote and directed the critically claimed Get Out which earned $250M worldwide for Universal Pictures. The film received four Academy Awards nominations including Best Actor, Best Director, Best Picture and earned Peele the Oscar for Best Original Screenplay. Said Glickman. "We cannot wait for the world to see what the mind blowing combination of Jordan, Win and Nia bring to the legend of Candyman. They have created a story that will not only pay reverence to Clive Barker's haunting and brilliant source material but is also thoroughly modern and will bring in a whole new generation of fans." "The original was a landmark film for black representation in the horror genre. Alongside Night of the Living Dead, Candyman was a major inspiration for me as filmmaker -- and to have a bold new talent like Nia at the helm of this project is truly exciting. We are honored to bring the next chapter in the Candyman canon to life and eager to provide new audiences with an entry point to Clive Barker's legend." 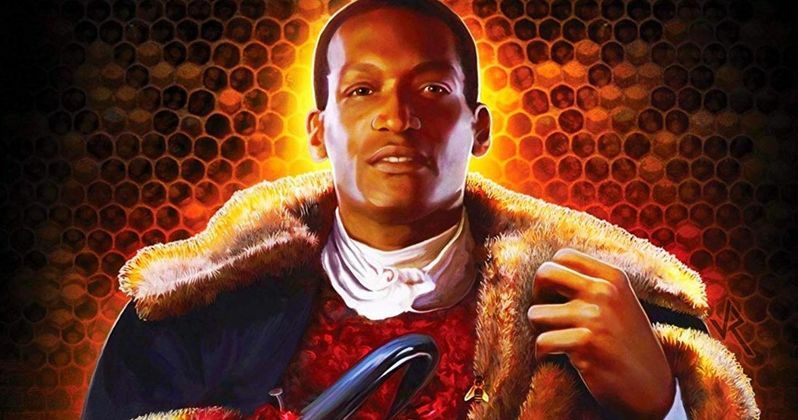 MGM will produce and finance Candyman with Universal handling domestic theatrical distribution. Adam Rosenberg, MGM's Co-President of Production and Tabitha Shick, MGM's Vice President of Production will oversee the project on behalf of the studio and Ian Cooper will produce for Monkeypaw. Under the Monkeypaw Productions banner, Jordan Peele wrote, produced and directed the critically acclaimed blockbuster Get Out, which received four Academy Awards nominations and earned Peele the Oscar for his screenplay. Most recently, Monkeypaw produced Peele's second original feature, Us, for Universal Pictures. The social thriller starring Lupita Nyong'o will be released in March 2019. Earlier this year, the company produced Spike Lee's BlackkKlansman, the true story of an African-American detective who infiltrated the KKK. Monkeypaw is also working on the stop-motion animated feature, Wendell & Wild, from director Henry Selick for Netflix. On the TV side, Monkeypaw is producing the upcoming docuseries Lorena, an examination of the infamous Lorena Bobbitt case, which will be released in early 2019 for Amazon Studios. Also with Amazon, Monkeypaw is developing The Hunt, a series based on true events that follows a diverse band of revenge-seeking Nazi hunters in 1970s America. Additionally, Monkeypaw is producing Lovecraft Country for HBO, an anthological sci-fi thriller series set in the 1950s Jim Crow South, in conjunction with J.J. Abrams' Bad Robot; Weird City, a sci-fi comedy that will air on YouTube Originals; and the second season of The Last O.G., the TBS comedy starring Tracy Morgan and Tiffany Haddish. Also currently in production for Monkeypaw is a new installment of Rod Serling's visionary television series, The Twilight Zone, in which Peele will revive the iconic role of the narrator. Produced with CBS Television Studios in association with Simon Kinberg's Genre Films, the mind-bending anthology series will air exclusively on CBS All Access. This news comes hot off the press from MGM.